Formed in 2013, the Montrose Trio is a collaboration stemming from a long and fruitful relationship between pianist Jon Kimura Parker and the Tokyo String Quartet. Mr. Parker was the quartet’s final guest pianist, and a backstage conversation with first violinist Martin Beaver and cellist Clive Greensmith led to the Montrose Trio’s creation. 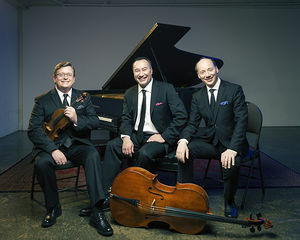 The Montrose Trio gave their debut performance for the Chamber Music Society of Detroit, with subsequent performances at Wolftrap, in Montreal, and at the Santa Fe Chamber Music Festival. They have continued to perform on major series in cities including New York, Baltimore, Buffalo, Chicago, Cleveland, Detroit, Houston, Indianapolis, Jacksonville, La Jolla, Menlo, Philadelphia, Phoenix, Portland, Seattle, Vancouver, at the Hong Kong Chamber Music Festival, and throughout Italy. Pianist Jon Kimura Parker performs with major North American orchestras on a regular basis, including recent concerto performances with the orchestras of New York, Chicago, and Philadelphia. He also appears in Off the Score, an experimental group with legendary Police drummer Stewart Copeland. He is Artistic Director of the Honens International Piano Competition, Artistic Advisor of the Orcas Island Chamber Music Festival, and Professor of Piano at the Shepherd School of Music at Rice University in Houston. In 2018-19 the Montrose Trio performs in cities including Detroit, Houston, Joplin, Monterey, Portland, Tulsa, Rockport, and Wolftrap. For more information please see montrosetrio.com.